I have no idea what the Fed will do except to say it is likely to make matters worse regardless. That is the nature of monetarism in 2015 in no small part because that is where a financialized economy can only lead. Having been unable to do so this year so far, however, does seem to suggest at least a bias of confusion and doubt. Again, that relates to monetarism as it never lives up to its promises. If the FOMC does decide to forgo in September, they have an established excuse already lined up. While never acknowledging any weakness inside the United States, China stands as an easy target for them to say “no” on ending ZIRP. Janet Yellen can dutiful point to “overseas” developments, and even be non-specific about it, to which the FOMC “has to acknowledge.” It will be painful to her to state that case because orthodox economics demands very little connection between the world’s problems and the “booming” US, but at least that way she can plausibly (for her mind and what is accepted in the mainstream) maintain that she has done her job at the same time as not actually doing it. In the meantime, the Fed’s isolation may add to pressure on it to keep interest rates lower for longer and protect the U.S. economy. In the past month, traders have pared bets the Fed will boost rates at its Sept. 16-17 meeting to 30 percent odds, down from 50 percent as recently as Aug. 13. If the Fed is acting alone it is doing so because it believes the US is alone in its bright and shining visibility while the rest of the world suffers from the “unknown” origins of Krugman’s “deflationary vortex.” Economists listen to the “dollar’s” great warning song but can never actually hear it. A sharp drop in global trade growth this year is underscoring a disturbing legacy of the financial crisis: Exports and imports of goods are lagging far behind their pace of past expansions, threatening future productivity and living standards. For the third year in a row, the rate of growth in global trade is set to trail the already sluggish expansion of the world economy, according to data from the World Trade Organization and projections from leading economists. Before the recent slump, the last time trade growth underperformed the rate of an economic expansion was 1985. US GDP is supposedly much better the past few years yet there isn’t any sense of it beyond just GDP. Given the trends inside the US too, there isn’t actually much confirmation of the US “boom” there either. GDP says the Fed has been successful in creating “demand” yet producers both internal and very much external take huge issue. Either the whole world has gone crazy or the US is understating inflation or overstating actual (as opposed to statistical) growth (and it could be some of both of those latter possibilities). It is here where Janet Yellen’s wage discussion is most applicable, which I sense is the probing doubts that have so far paralyzed policy. If the US were growing as is described then there would be (not might be) detectable wage gains. There aren’t; a fact which even she will admit. That may be what seals the fate of the coming economy, as what that suggests, even demands, and what the FOMC will have to appreciate even in only small ways they allow themselves to deviate from orthodoxy, is that the world is not crazy; it is economists on the other side of dividing line away from reality. World trade volumes may rebound a bit in the second half of the year, but grow just 1% for all of 2015, estimates Paul Veenendaal, an economist at the CPB Netherlands Bureau for Economic Policy Analysis, which closely follows world trade.  That is well behind the expected level of global growth, forecast at 3.3% by the International Monetary Fund. “It’s fairly obvious that we reached peak trade in 2007,” said Scott Miller, trade expert at the Center for Strategic and International Studies, a Washington, D.C., think tank. 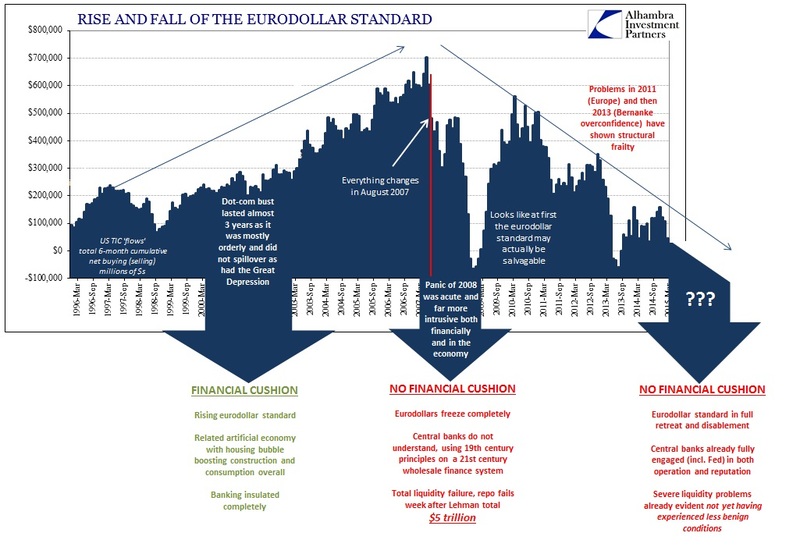 You might even say peak trade was August 2007; once the eurodollar started to fall apart there was no going back. And that is the fact that animates all of this mystery, connecting everything from China to Brazil to Japan to junk debt to persistent liquidity crises to all the four corners of this Earth. The Fed continues about its efforts as if there is nothing different between now and then; that banking and orthodox economics and QE’s all apply now as they would have in 2006 or 2001. That they come up short time after time cannot be, for them, a matter of policy but rather someone else’s fault. Always somebody else to blame. As I have written before I will reiterate here because it, too, is the stirring factor in what is likely to come. 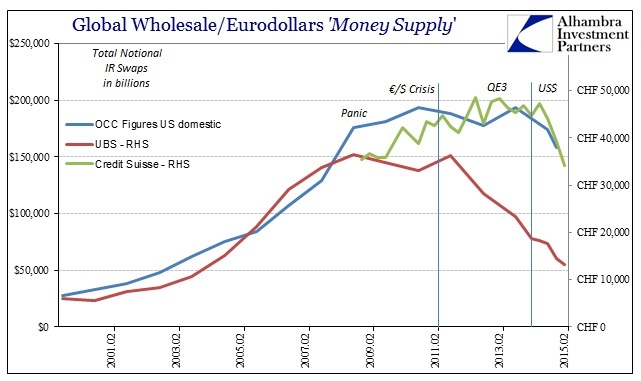 Asset prices and economies still have to adjust to the lost eurodollar boost, artificial as it was. Either an organic resurgence will validate asset prices and economic expectations, even diminished here, or both will have to sink to more closely align to permanent wholesale decay. Will they or won’t they? In the end, no one will care; that is a debate for ten years ago.